8 - Brandy Wharf to Newport - River Ancholme, Humber Estuary, Market Weighton Canal to Sod House Lock and River Foulness to Hasholme Garth and back to Newport. We had to get to South Ferriby around 11.00 as we had to get diesel and were due out onto the Humber at 12.00.This meant a fairly early start and we got away at 07.15. 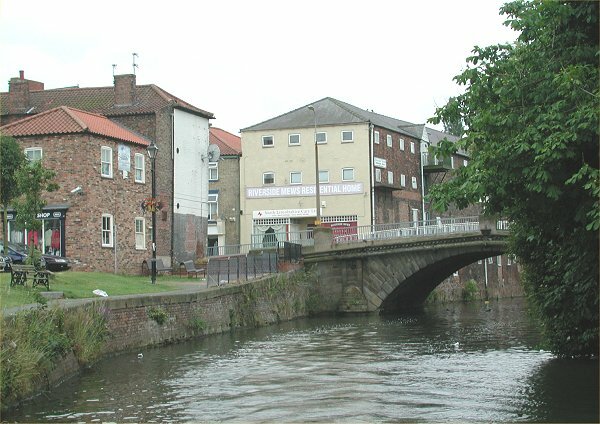 We went through the old route into Brigg and noted the half finished marina project and leisure centre on the upstream side of the town, all in all the more pleasant side and a much better spot for visitor moorings and sanitary station. The in and out junctions were passed at 08.35 and 08.55. Arrival at South Ferriby was at 11.00. We both filled up with diesel at Clapson's Boatyard. This was a surprisingly busy establishment with a good (sea!) chandlery. They managed to replenish both Earnest's and Frogmoore's depleted gaffer tape supplies! 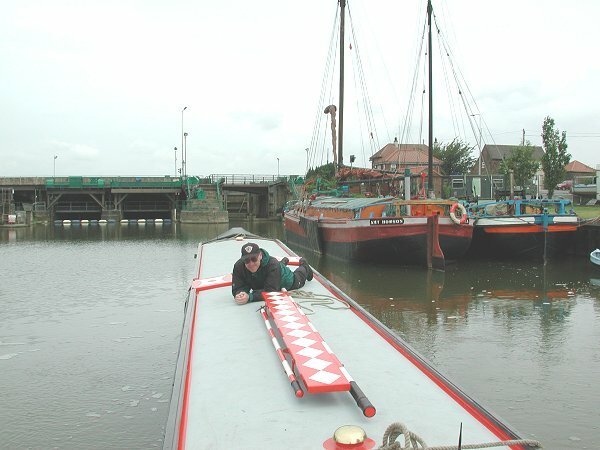 Neil went down to the lock a bit early, but they wanted to lock us out early as lunch time beckoned! Neil was ready with periscope exhaust on in no time, but John in Frogmoore was lagging and we were locked out (11.40) with out this being done. We milled about in the entrance for 15 minutes as John put on his exhaust extension. Neil had to hand across the Earnest Stilsons for fitting of this item ........and made sure he got it back! So off we departed (11.55) on our next tidal passage, around the back of Read's Island, then in channel and across to the north bank of the Humber to take the little used channel around the top of Whitton Sand (now really a grass covered island - a nature reserve ) to the English Heritage listed Humber Lock, the entrance to the Market Weighton Canal. There was no need to worry about the exhausts, the weather check was for a Force 2 wind direction westerly, so as we were coming up on the last of the flood, it was wind with tide. It ended up like a millpond. 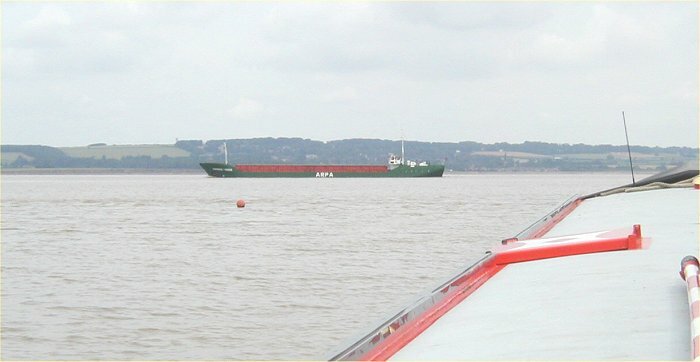 We delayed coming out from the protection of Read's Island to let a couple of coasters pass, then full steam ahead, in channel as a container ship was spotted coming up stream bound for Goole. We made radio contact with the "Aguila", as soon as we could read the name with the bins. We were to be overtaken in the tightest part of the channel, near Brough, so we layed to, out of channel as the "Aguila" pilot kindly slowed down to a crawl. It's passing was barely noticed. 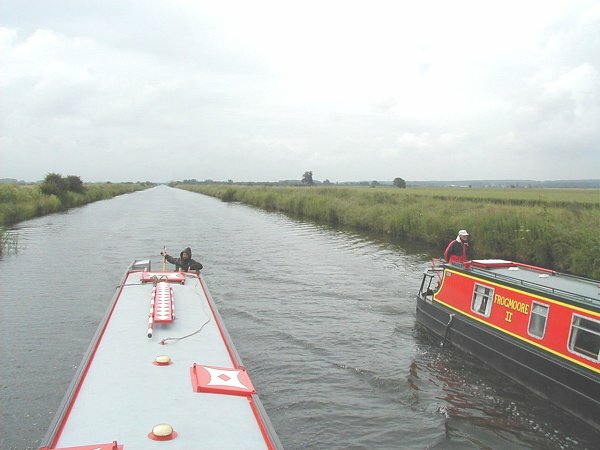 After this it was the last section of the main channel, then behind Whitton Sand. Arrival at Humber Lock was at 13.30, to a welcoming committee of EA staff including the Sluice Keeper, as well as newsgroupy Neil Puling, who had come out to greet us and stay with us for the rest of the day. 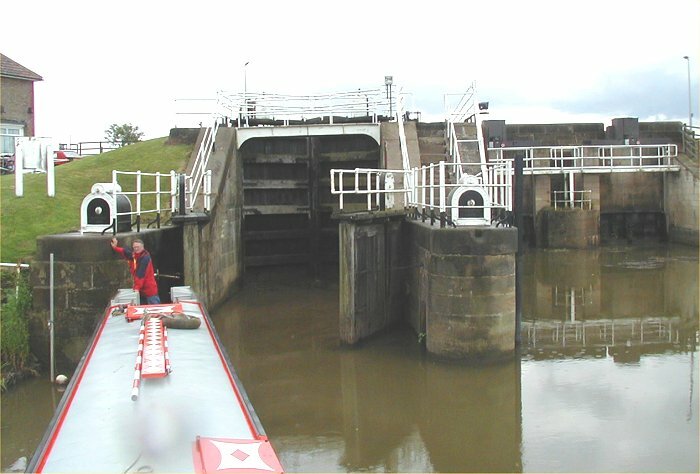 Both narrowboats entered the lock, but owing to some difficulties going DOWN to the canal level, we now recommend that narrowboats use the lock singularly. This is because the chamber walls slope out and have some serious timber bulk strengthening. 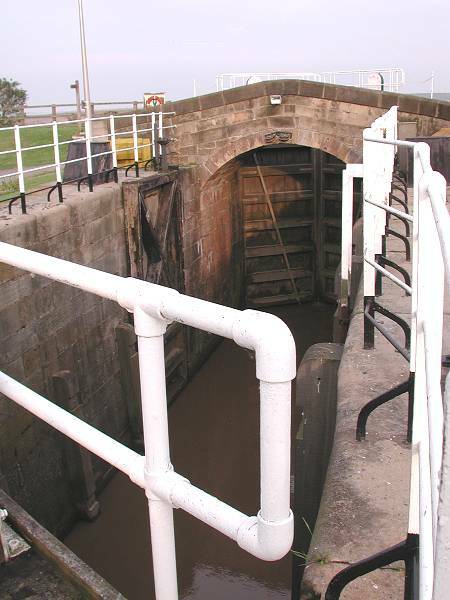 This was retained during the rebuild about 10 years ago when the lock was listed and the sluice was rebuilt (but in a sympathetic way). We emerged unscathed at 14.00, having picked up Neil Purling. It was deep and weed free up to the supposedly "un navigable" Newport Bridge. 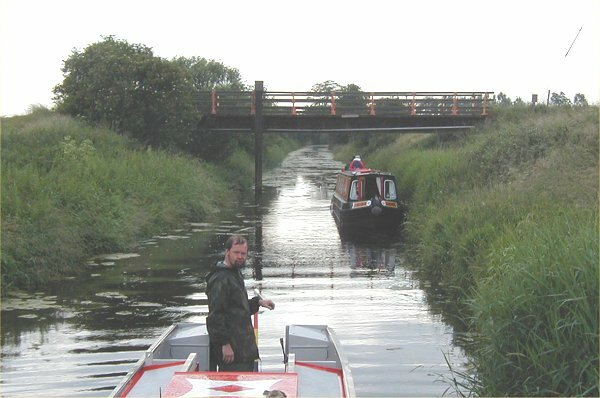 The right of navigation still exists on the canal and this is administered on behalf of the Market Weighton Internal drainage Board by the EA. 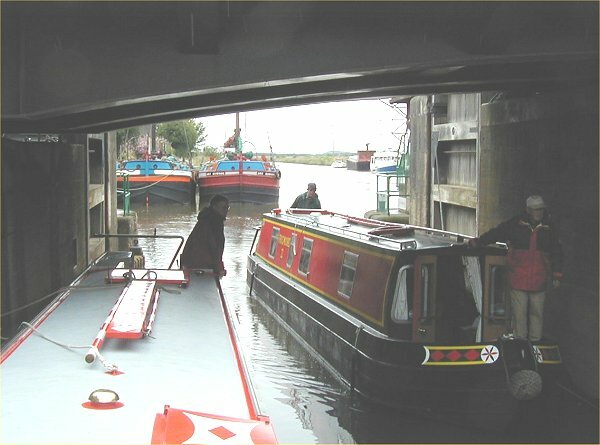 Navigation Rights through Humber Lock and just a short section under the Newport Bridge were removed in 1970. 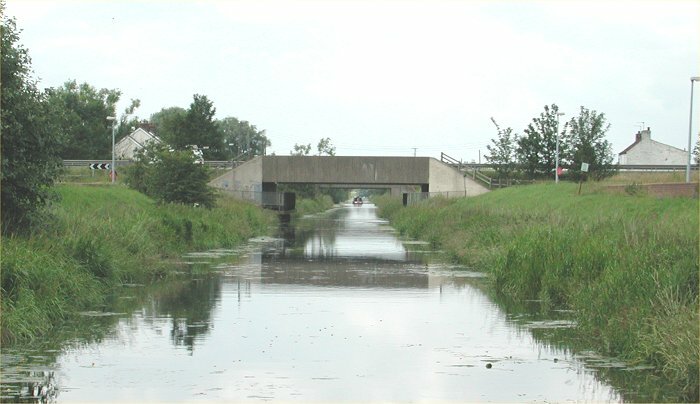 The bridge section was just due to closure of the canal as they rebuilt the bridge. Newport Bridge was approached with caution as we did not know why this 9ft headroom bridge was declared impassable. Perhaps, we thought, there was a shallow invert?.................This proved not to be the case and we went under easily. The bank beside the road, just above the bridge was, as spotted on our Explo Day, seemed a reasonable, non private spot to moor for the night. 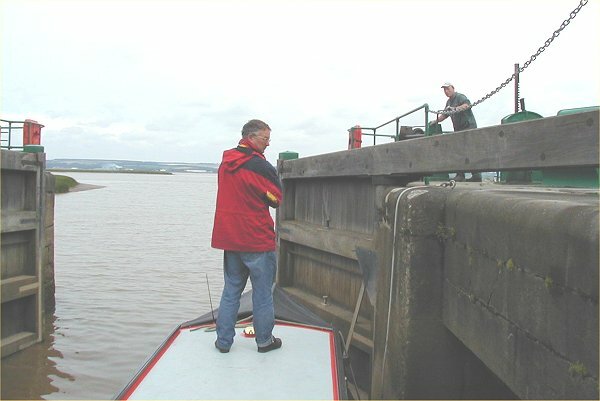 We had previously curtailed our visit by a day and we were due out of Humber Lock at 11.00 the next day, so any exploration above Newport, had to be done this day. On we ploughed, still deep and weed free, under the M62 and up to the junction with the River Foulness. Here, it would be as hoped, an easy wind for Earnest. This was not the case anywhere below, except just above the entrance lock. 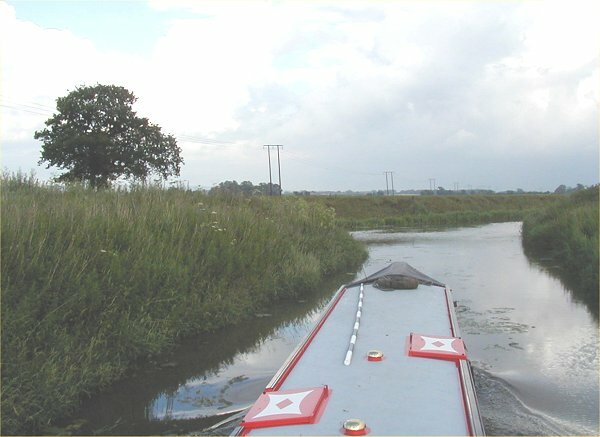 Firstly we carried on up the canal section, it soon became very narrow and the depth started getting shallower. Frogmoore was leading and this came to grief a hundred yards below the abandoned Sodhouse Lock chamber. This was found to be due to a very sandy silt being deposited by a side drain. This was rock solid. Earnest went forward to have a go at shifting this sand bar, but to no avail. We managed to get off the boats and have a wander up to Sodhouse Lock. The canal beyond was completely filled in, the line being visible by a swath of poppies in the field. We ground to a halt at 15.50 and started off back in reverse at 17.45. We winded at the junction with the River Foulness (17.45) and then started back up the River Foulness, in reverse. This was also deep - 5ftish - the blanket weed at the confluence was then confined to the sides. At 18.30 we gave up, at Sand Hill Farm Bridge. This was only about a mile up the river. It seemed that this would be navigable to at least Welham Bridge, which is around another four miles up. 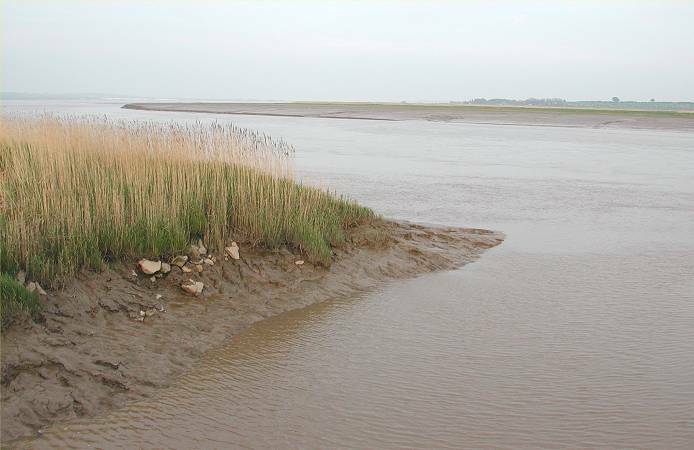 It was a rather quick exit from the River Foulness, where we trashed a lot of blanket weed! Back at junction with the Market Weighton Canal at 18.50 and then to Newport for the night, at 19.20. John managed to get Frogmoore close to the bank and we breasted up to the Frogmoore mooring pontoon. 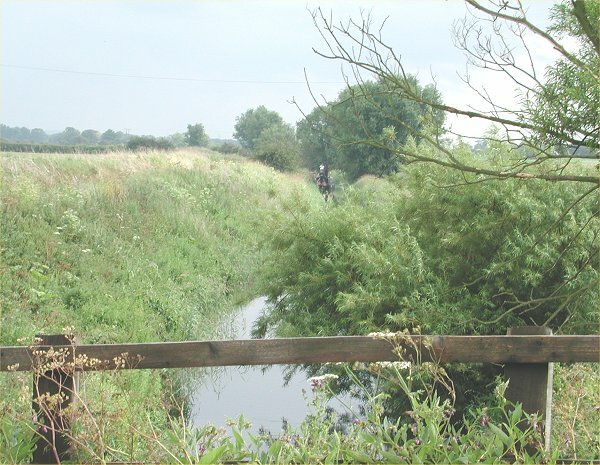 Neil Purling left here, with rather a long walk back to his motorbike at Humber Lock. That night John and Robbie ate out, but we ate on board. Later we had a "Courtesy Call" from one of the South Ferriby EA Officers. This knowledgeable chap stayed for a good few hours chat. 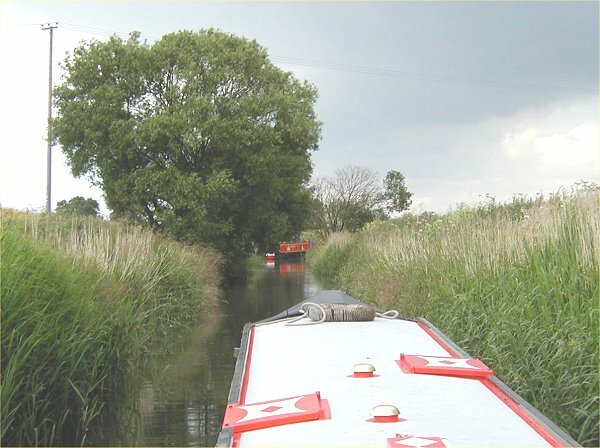 He had spent most of his working life on the water and we learnt a LOT about the Humber and the River Ancholme. Passing through Brigg. River Ancholme. 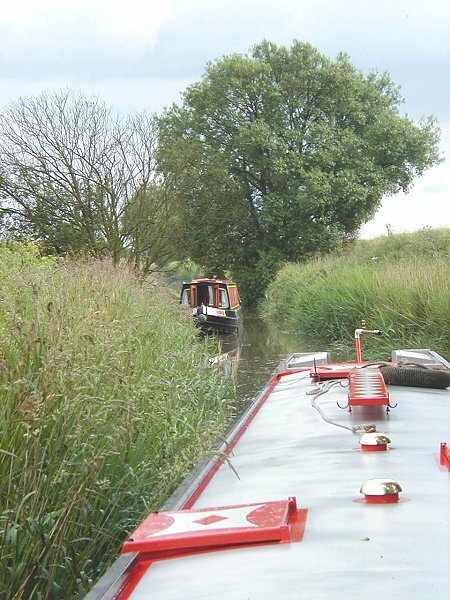 Synchronised narrowboating for at least half an hour - River Ancholme - exciting init? Picture Martin Wilson. 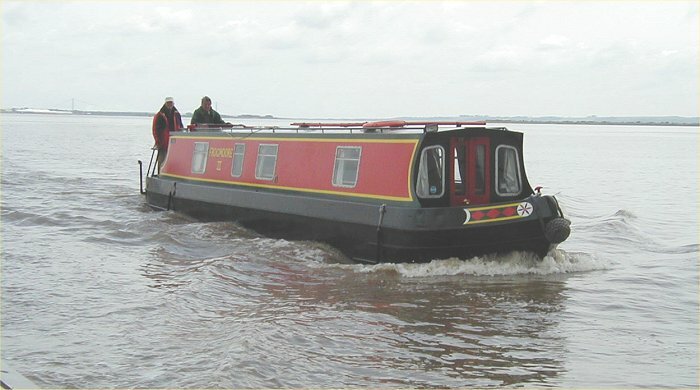 Exiting South Ferriby Sluice. River Ancholme. 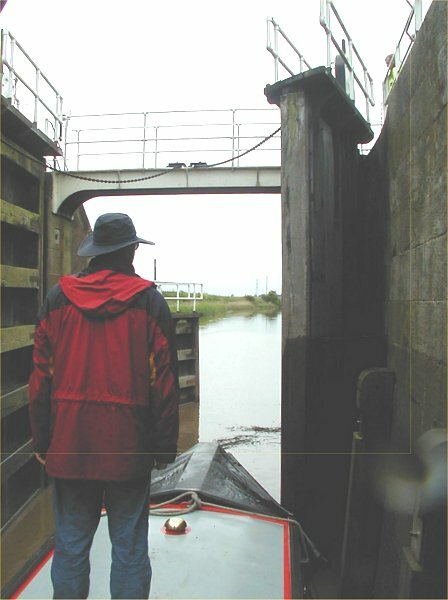 Exiting South Ferriby Sluice. The over bridge is raised as you rise up. 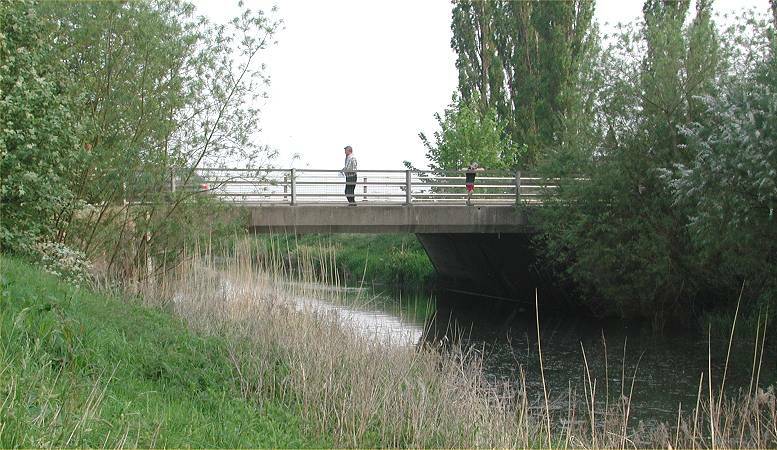 River Ancholme. Picture Martin Wilson. 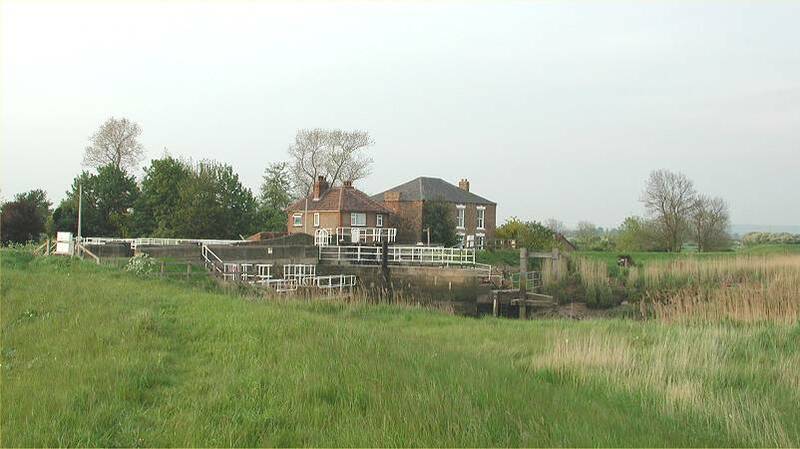 Exiting South Ferriby Sluice. River Humber. Picture Martin Wilson. Looking back at South Ferriby. River Humber. NB Frogmoore II under power. River Humber. Picture Martin Wilson. Ambling round the back of Read's Island. River Humber. Hanging about waiting for passing ships. River Humber. Picture Martin Wilson. Hanging about waiting for passing ships. Rig is for recovery of crashed Tornado. River Humber. Picture Martin Wilson. 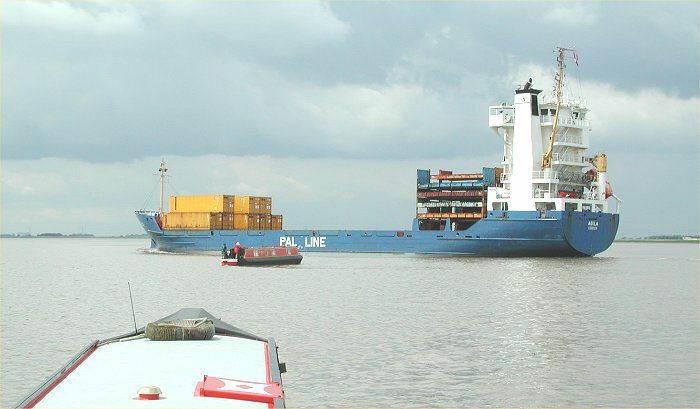 Just out of channel at Brough, we wait for this mini container ship to pass. River Humber. 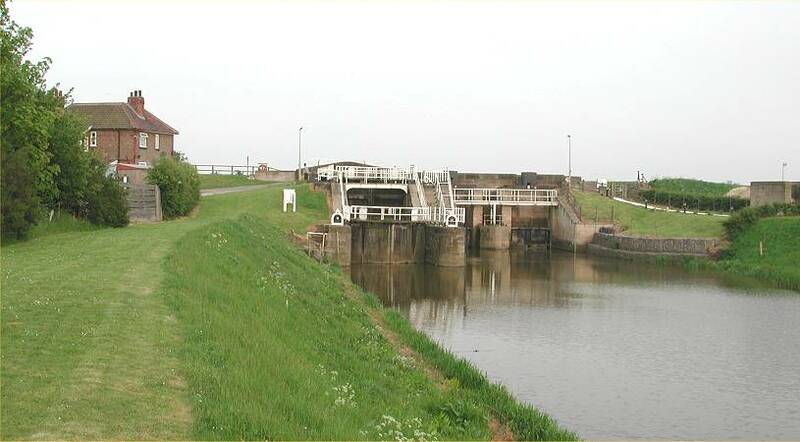 Arrival at Humber Lock, entrance to Market Weighton Canal. River Humber. 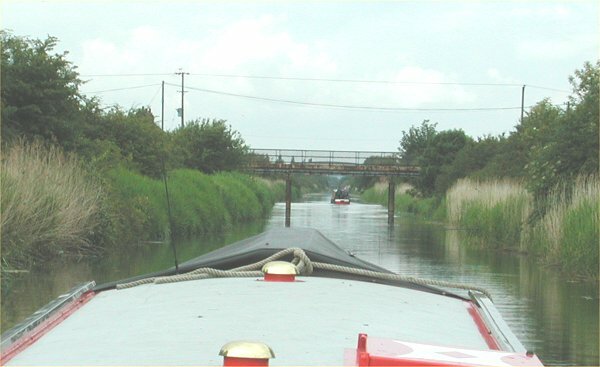 Having locked down off the Humber, we enter the Market Weighton Canal. Picture Martin Wilson. 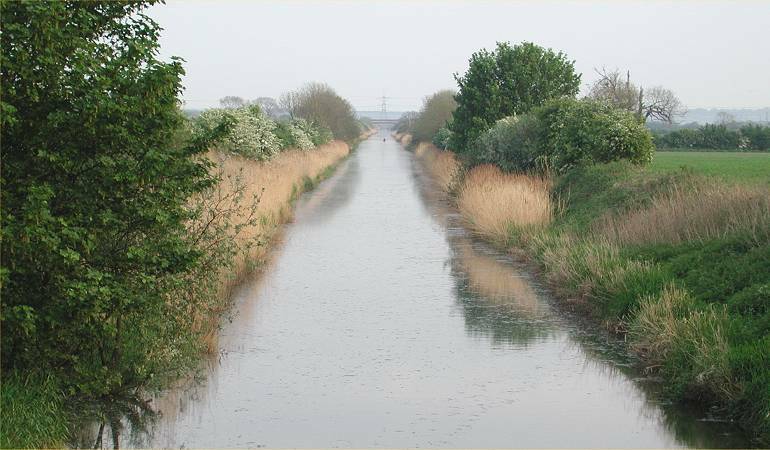 Looking across at Whitton Sand, downstream from entrance cut to Market Weighton Canal. Start of flood. River Humber. Picture taken on our Explo Day out. 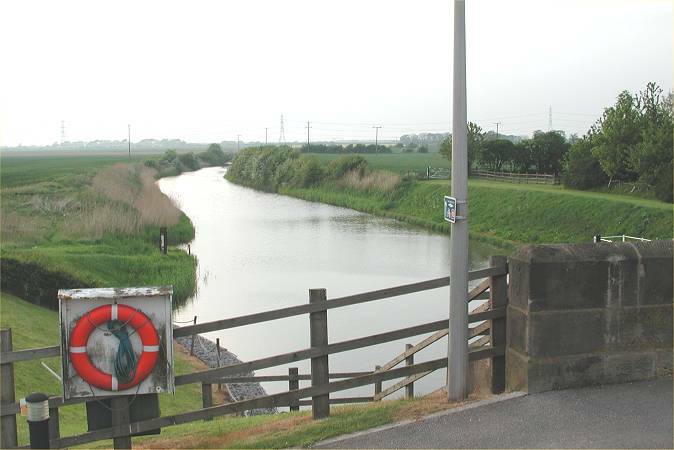 Looking across at Whitton Sand, upstream from entrance cut to Market Weighton Canal. Start of flood. River Humber. Picture taken on our Explo Day out. 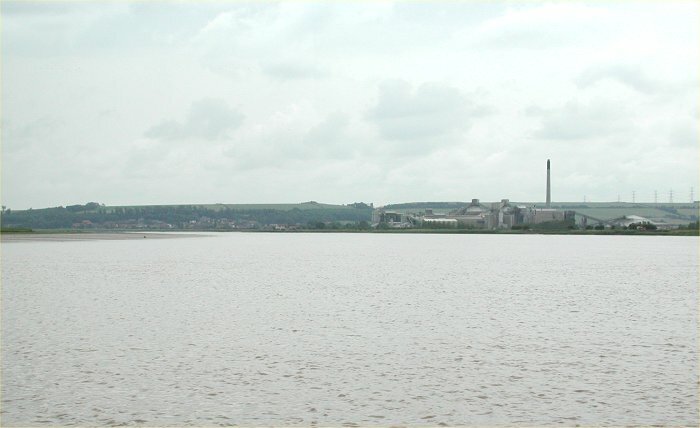 Looking across at Whitton Sand, downstream from Humber Lock, Market Weighton Canal. Start of flood. River Humber. Picture taken on our Explo Day out. 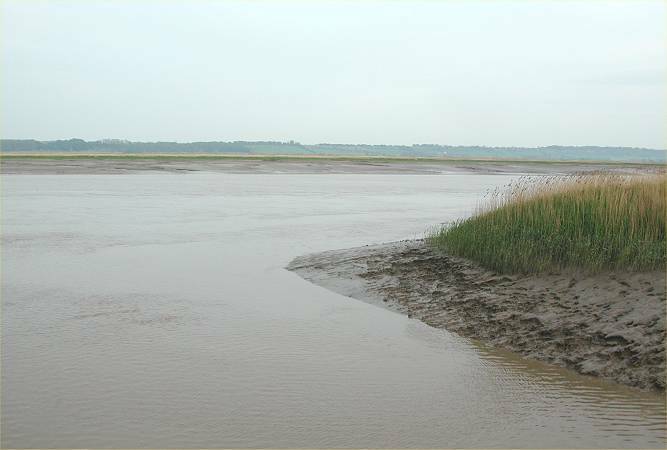 Looking across at Whitton Sand, upstream from Humber Lock, Market Weighton Canal. Start of flood. River Humber. Picture taken on our Explo Day out. 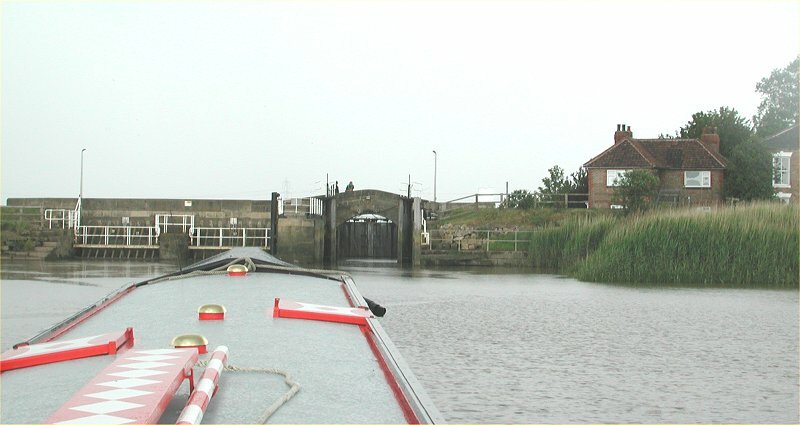 Exiting Humber Lock onto the Market Weighton Canal. Picture Martin Wilson. Humber Lock, Market Weighton Canal - detail. Picture Martin Wilson. Humber Lock, Market Weighton Canal - detail. 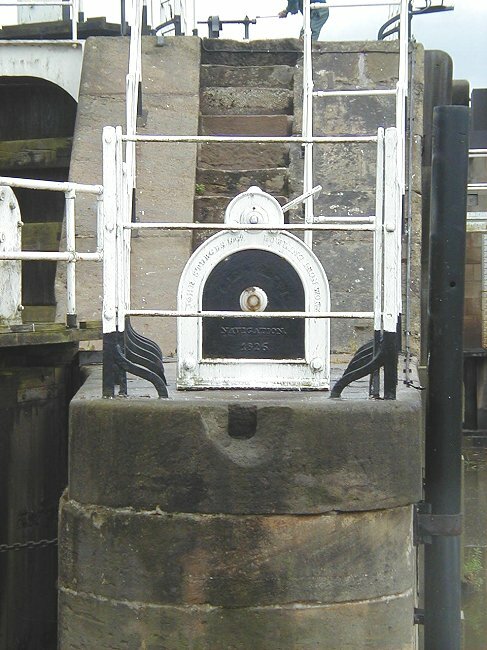 Humber Lock, Market Weighton Canal - detail. Picture taken on our Explo Day out. Looking up from Humber lock, Market Weighton Canal. Picture taken on our Explo Day out. 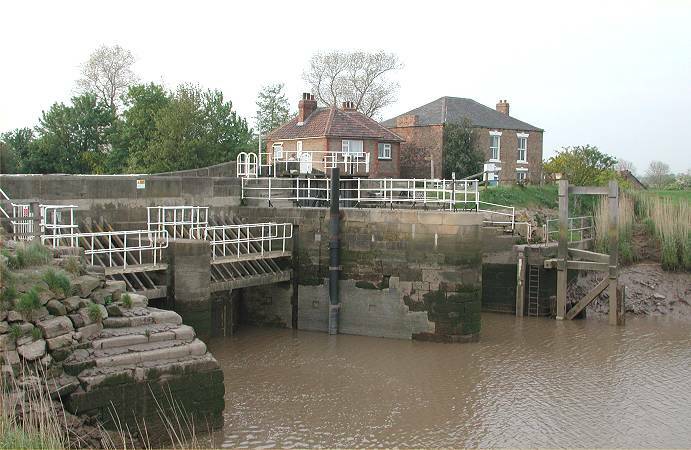 Humber lock, Market Weighton Canal. Picture taken on our Explo Day out. Martin Wilson, Ian Clarke and Neil Purling. 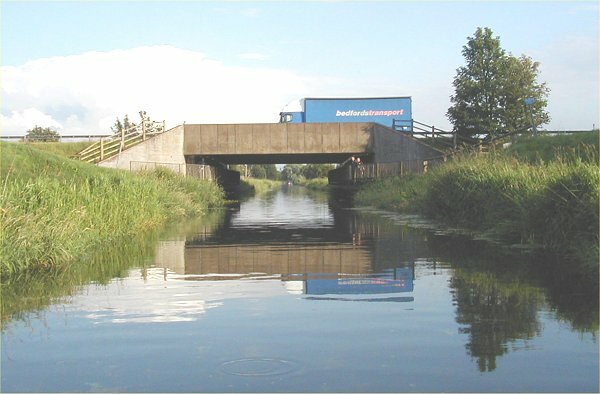 Market Weighton Canal. Approaching Newport Bridge. 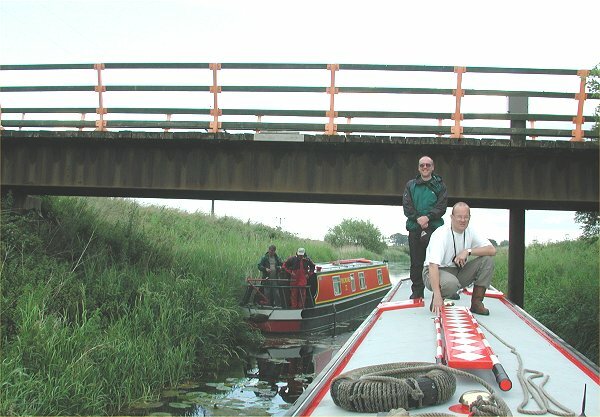 Market Weighton Canal. Picture Martin Wilson. Newport Bridge. 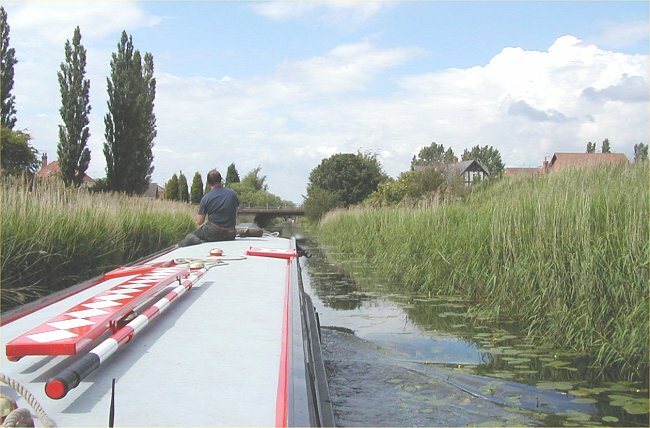 Market Weighton Canal. Picture taken on our Explo Day out. Looking down from Newport Bridge. 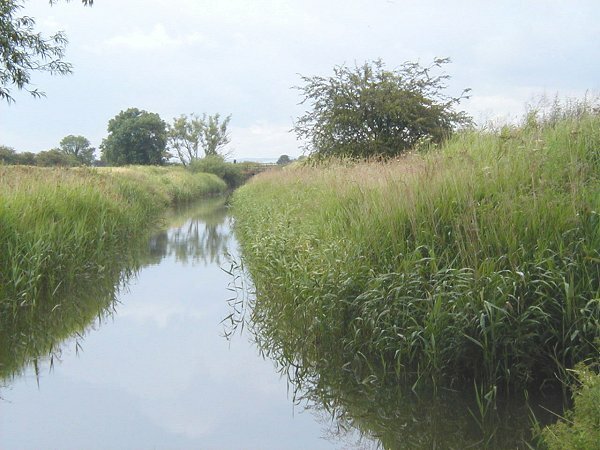 Market Weighton Canal. Picture taken on our Explo Day out. Approaching the M62 Bridge, NB Frogmoore II in the distance. Market Weighton Canal. 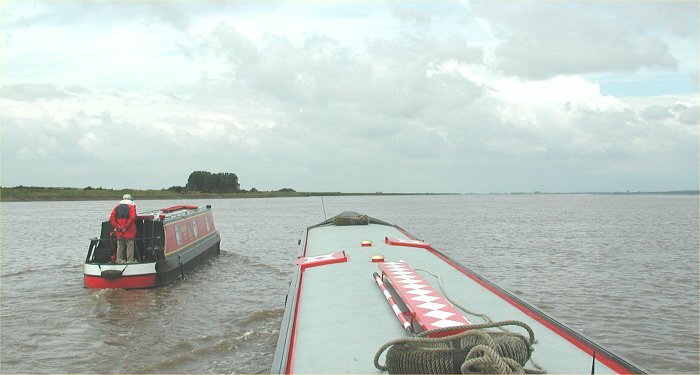 Junction with the River Foulness (to left) at North America. 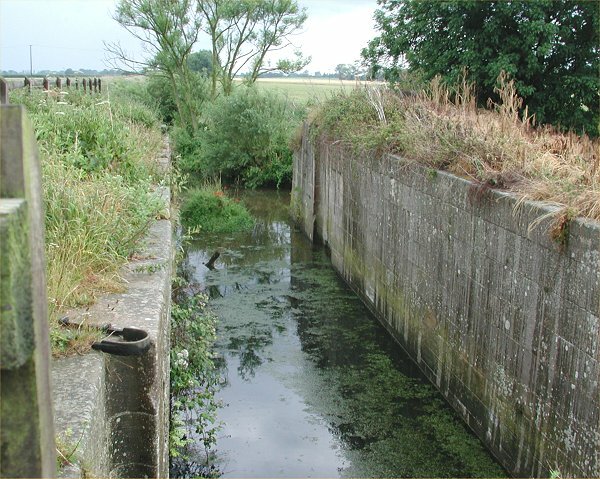 Market Weighton Canal. Our limit of navigation up the Market Weighton Canal. Picture Martin Wilson. Our limit of navigation up the Market Weighton Canal. Looking up at Sodhouse Lock. Picture Martin Wilson. Looking back down the Market Weighton Canal from Sodhouse Lock. Our abandoned boats in distance. Sodhouse Lock chamber. 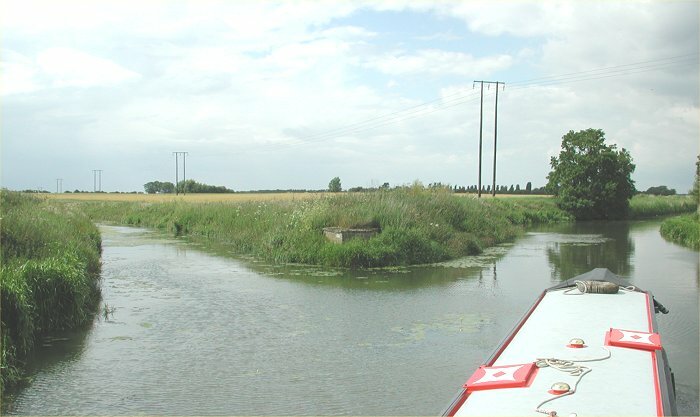 Market Weighton Canal. Sand Hill Farm Bridge. Our limit of reversing back up the River Foulness. Sand Hill Farm Bridge. Our limit of reversing back up the River Foulness. Picture Martin Wilson. M62 Bridge, looking towards Newport. 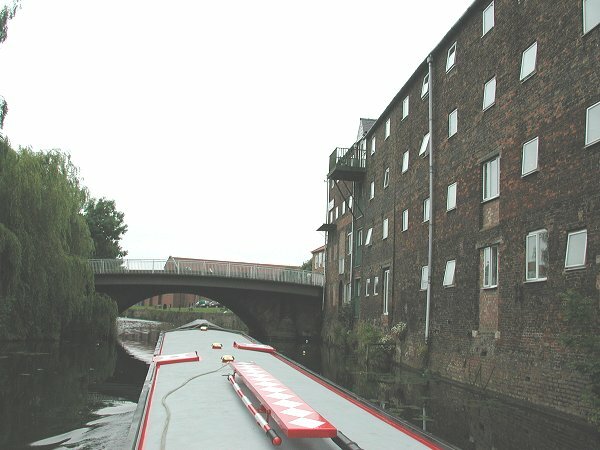 Market Weighton Canal. Picture Martin Wilson. Our overnight mooring at Newport, just above the bridge. 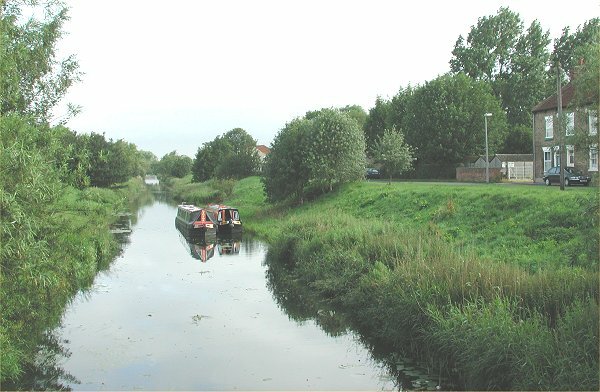 Market Weighton Canal.